I love a good time travel movie. Wait, didn’t I already say that in a previous review? “Edge Of Tomorrow” sounds like a daytime soap opera, but it’s actually a rollicking fun science fiction about a cowardly military officer (Tom Cruise, at his better), who’s forced to participate in a battle against aliens taking over Europe. After saying the wrong thing to a general, Major Cage finds himself a private in a techno battle suit, crossing the English Channel to invade, yes, Normandy. Soldiers expecting a cakewalk instead are ambushed and massacred, in a thankfully not too gory but plenty scary scene. Cage has just enough time to glimpse a female soldier wielding a huge sword before a spinning, tentacle alien … kills him. But a last second encounter gives Cage a do-over—I did mention this was SF, right? He wakes up the previous morning, and finds himself going through the same crap all over again, with the same outcome. Then he wakes up again. And again. After a while, he gets better at fighting through sheer repetition. Then he discovers exactly one other person who believes his story, because it happened to her—and she just happens to carry a big honkin’ sword. Now all they have to do is make it a little further off the beach, time after time, until they track down the Big Bad alien and kill it before the human race is wiped out. No pressure. Time travel’s hard to pull off well, and it’s especially hard not to bore the audience to death with “Groundhog Day” style repetition. Taking a cue from the Bill Murray, this warlike version plays funny, or as funny as it can considering Cage only resets when he dies. Cage is at first confused and terrified, then messes with people, then gives in to despair before his increased skill and caring for the warrior Rita (Emily Blunt) leads to determination. Blunt, by the way, gets to shoot Tom Cruise in the head repeatedly, and who hasn’t wanted to do that? 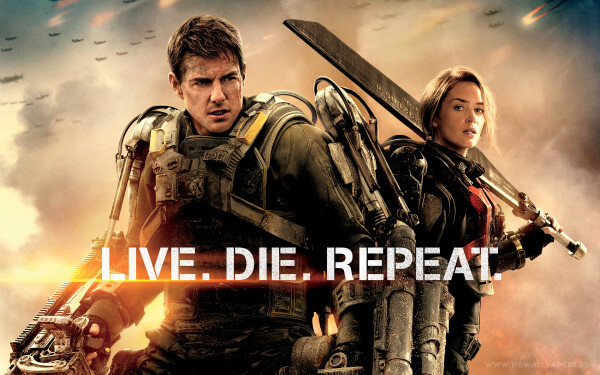 Despite its subject matter—it’s basically another movie about the apocalypse—“Edge Of Tomorrow” is great fun and certainly action packed. Cruise, who I’m no fan of, is perfect for the role and proves he really can act. Of course, you’d act scared too, if you knew you were about to die—again. Blunt does well, the effects are great, and I loved the supporting cast—especially Bill Paxton, who I actually didn’t recognize. He’s a tough and sometimes befuddled Master Sergeant who delivers one of my favorite lines … although maybe you have to be from the Bluegrass State to truly appreciate it. Entertainment Value: 3 ¾ out of 4 M&M’s. Being too easily entertained, I’m trying to avoid giving out too many perfect ratings. Oscar Potential: 2 out of 4 M&M’s. It could pick up a nomination in the effects area, or something along those lines. The acting is pretty good, but would have to be better than perfect for an SF film to get a nomination. The aliens will have to get through me before they take over Europe and there’s the sequel or prequel or something! They didn’t seem to have much trouble getting through anybody — but if anyone could stop them, it would be you! I might just give this one a try. I’m not a Cruise fan either, but the comedic element gives me hope…. This looks like it might be fun to see, if nothing better is playing (like maybe something with George Clooney). We certainly didn’t see anything we thought would be better — that was playing at that moment. That axe looks like something used to pull pizzas from a wood fired oven. Are there alien pizzas in this film? This gargantuan sword thing that I see so often in Japanese manga and anime strikes me as odd. Maybe they’re overcompensating for something? Who hasn’t wanted to shoot Tom Cruise? Snicker, snicker, giggle, giggle, guffaw!